Smith’s message of global engagement is finding a receptive audience among ambitious young women around the world. 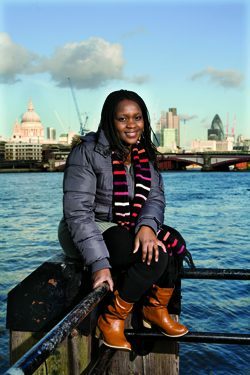 Margaret Nyamumbo ’11 came to Smith from Kenya to study mathematics and economics. Karen Kristof isn’t used to being treated like a celebrity, but in the fall of 2008, while visiting a school in Nanjing, on the south bank of China’s long Yangtze River, Smith’s senior associate director of admission was besieged by high school girls. Yingtong Ding ’13, from Nanjing, China, hopes to pursue a business career. For Cohen’s class of fourteen, learning of their fellow females’ experiences prompted some of them to take action. “Some of my students, even as first-years, are deeply committed to helping these women and have decided to devote their careers to this work,” Cohen says. One student already has done an internship with a microfinancing organization that supports women in Bangladesh, and another is planning to attend an international conference on women’s leadership in Dubai this spring. “They’re already deeply engaged and they’re only 18 years old,” Cohen says.